It took fourteen excruciating long games for him to finally open his scoring against West Ham in April, almost three months after his transfer. Carlo Ancelotti was fired after Chelsea finished a lowly second to Manchester United. Apparently, not getting the fifty million baby to score was a major reason in his sacking. The next season, Torres turned more into a playmaker with far higher number of assists, and started playing way deeper than a striker should. His open goal miss against Old Trafford is perhaps the highlight of his Chelsea career. Drogba kept on starting the important games, both under Villas Boas and Robbie di Matteo. Torres later admitted in an interview that there was a point when it didn't matter to him if the team won or lost. His goal against Barcelona (which was inconsequential to the result) and the hat trick against QPR gave the Chelsea fans some hope that he might return to his old ways of scoring. He came off the bench in the Champions League final to win the corner that led to the Chelsea equalizer against Bayern Munch. However, he spoke of his frustrations shortly after the match. Received the Golden Boot at Euro 2012. The future looked bright. Drogba's departure made him the first choice at the club, but he failed to grab the opportunity, blocking Sturridge's progress in the way. As the season progressed, he went back to his old sloppy ways. Di Matteo was forced to bench him, and with no other striker, had to play the false nine- which ultimately cost him the job. Under Benitez, the optimists hoped he would go back to his Liverpool days. The first few matches showed promise, but the spark died down soon. 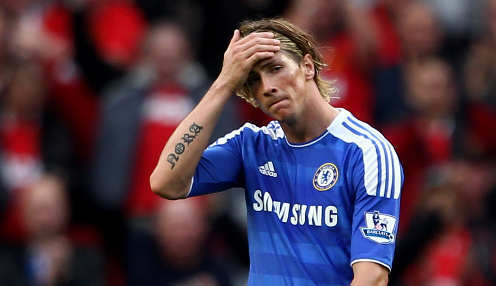 With the arrival of Demba Ba and departure of Sturridge, Torres was again second choice at Chelsea. He did practically nothing to prove his dominance over the new arrival. His latest horror show was against the not so famous Steaua Bucharest in the Europa League, where he looked least interested on the pitch as Chelsea lost 1-0. I guess that can be said about him in almost every match he plays. Apparently, Chelsea are willing to sell him for just £15 million as a makeweight for Radamel Falcao.